I couldn't resist! 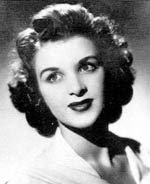 Miss America 1944 shot the tires out from a trespasser on her farm. She had to balance on her walker to take aim and then flag down a passing motorist to call 911. It kind of says it all doesn't it? But does it say it about gun control, the state of Kentucky or Miss America? You decide.